Use walnuts in your salads, spreads, garnish, chutneys, pastries, and whip up delicious appetizers, dishes and desserts. Enhance your cooking with these walnuts from Avarya. Akhrot Without Shell 3A	DF-WN-1492 Use walnuts in your salads, spreads, garnish, chutneys, pastries, and whip up delicious appetizers, dishes and desserts. 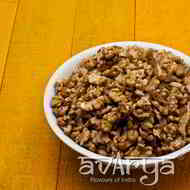 Enhance your cooking with these walnuts from Avarya. The shelf life of Akhrot Without Shell 3A is 30 days. This product is suitable for Jains.